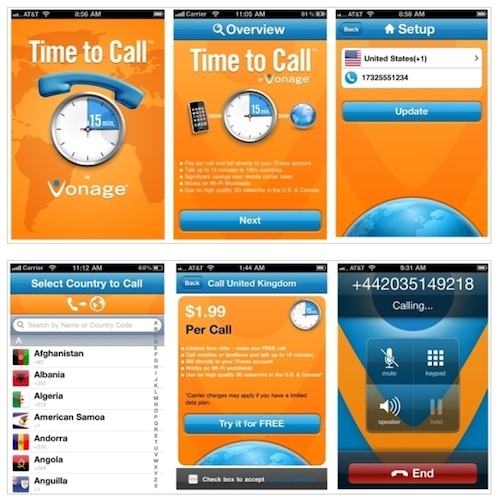 Apple Thoughts: Vonage's Time to Call App: 15 Free Minutes, International Calling and a Free iPad 2! Vonage's Time to Call App: 15 Free Minutes, International Calling and a Free iPad 2! LIMITED TIME OFFER: Download now and call up to 15 minutes for FREE. If you go to the Vonage site, you can easily find out how much your 15 minutes of calling time will be as it is based on the country you are calling. Simply select the country from the drop down list and it gives you the cost in US Dollars. Pretty simple. For example, calling Argentina will set you back $1.99 USD for 15 minutes of calling time, of course that is not including the 15 free minutes you get just for downloading the app. And make sure to read on to find out how to win an iPad 2 from Vonage as part of their promotion for the new app. Using the app couldn't be simpler, but I think I will let the below video tell the story. I can definitely see the advantage of this app if I needed to make international calls, but it also has the ability of being able to call in the US as well if you are limited on your regular minutes. And keep in mind, once you make the call, and if you don't use up the 15 minutes, they are saved for the next 12 months so it isn't like you have to use all 15 minutes with each phone call. They certainly couldn't make it any simpler, and now on to the best news of all. Vonage, is giving away numerous iPad 2s to promote this new app, so read on after the break to get the details on how you can win a 32GB iPad 2.